This product is formulated to stimulate the body’s immune response and combat attacks of all kinds (viruses, bacteria, fungi, parasites). It gradually reduces the symptoms of physical and nervous exhaustion which accompany infection, thus promoting a return to overall balance and recovery. Each softgel contains a mix of five essential oils, providing a total of 75 different active molecules. This is a long way from the type of synthetic product manufactured in a laboratory which contains just four or five at the most. What are the essential oils in Defense Mix? - Essential oil of oregano with compact inflorescences and essential oil of oregano from Greece, both of which are rich in carvacrol and thymol. These compounds confer a strong anti-infection effect (broad-spectrum anti-bacterial, antiviral and antifungal action) by promoting the destruction of pathogen cell membranes. They also offer exceptional tonic effects (physical, mental and sexual). - Essential oil of exotic basil, the chavicol content of which boosts the immune system, and encourages the elimination of harmful bacteria and intestinal worms. It also has significant antiviral properties as well as analgesic and anti-inflammatory effects which are particularly beneficial for relieving headaches and period pains. - Essential oil of peppermint, of which the aerial parts, rich in menthol (with its characteristic smell) and menthone, are used. As a result of these compounds, it offers significant pain relief, good for treating shocks, headaches and trauma as well as a wide range of ailments such as shingles, dizziness, neuritis, physical and mental asthenia and various digestive problems. - Essential oil of winter savory, obtained from the plant’s flowering tops and rich in carvacrol, thymol and para-cymene, and which has huge pathogen-fighting ability. A powerful antibacterial, it is also used for its exceptional antiviral properties and ability to stimulate immunity. It is also used traditionally as a sexual stimulant. - Essential oil of Ceylon cinnamon, which is said to offer one of the strongest antimicrobial effects in the aromatic pharmacopoeia. It contains a large percentage of cinnamic aldehyde and eugenol, making it a very broad-spectrum anti-bacterial (from Staphylococcus to Enterobacter, and including the famous Helicobacter pylori), as well as a remarkable antiviral, immune-stimulant, anti-fermentation agent, aphrodisiac, uterine tonic and emmenagogue. - The infection-fighting essential oils in Defense Mix have been selected by leading aromatherapy experts for their efficacy. Together, these oils produce additional effects with unexpected synergy, significantly enhancing the ability to combat aggressors. - Internal use of essential oils is particularly tricky: it requires sound knowledge and even the advice of a qualified therapist as the effects of aromatic compounds can be very powerful. Defense Mix has been the focus of considerable expertise which means you can take it in complete safety, knowing it presents no risk to your health and that the combination of oils has been selected by top health professionals. - Calculating the correct daily dose and mix of essential oils can be as tedious as it is risky: the slightest error can lead to unwelcome side effects of varying severity. 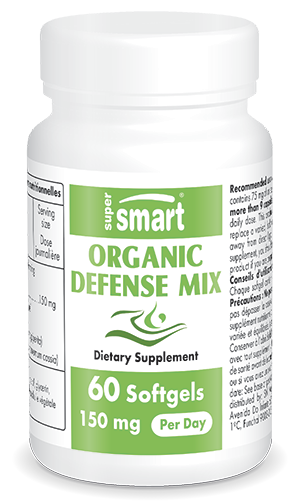 With Defense Mix, there’s no such risk since the ready-to-use softgels contain meticulously-researched doses. It therefore saves precious time and facilitates therapeutic observance. Many are those who lose out on the synergistic effects of essential oils because creating the right blend is too laborious. Contrary to popular belief, phytotherapy is still the most widely-used system of medicine in the world. It has a huge range of therapeutic uses including antiseptic, antiviral, antibacterial, anti-diabetes, hormone-balancing and even anti-rheumatic applications. The use of essential oils known as aromatherapy is part of this plant-based medicinal heritage. In recent years, this form of treatment has grown in popularity thanks to luminaries such as René-Maurice Gattefossé, considered to be one of aromatherapy’s founding fathers, and Dr Jean Valnet, who was responsible for significantly expanding research in this area, research which has been followed by a great many scientific figures. Today, these natural remedies bear no resemblance to the elixir of alchemists, even if we owe these pioneers a debt of gratitude for giving us certain methods of extraction. These therapies are approved by the scientific community, and are hugely popular with those looking for a clean and efficient form of medicine, validated by the experience of our forebears. Other ingredients: rapeseed oil, glycerine, water, tocopherols. Each softgel contains 75mg of mixed essential oils. Caution: Do not exceed 9 softgels a day. Not to be taken by pregnant women or children. Do not take more than 9 capsules a day.